Ready to eat. Used for stir fry meat dishes or serve with rice. Store in a cool dry place, keep refrigerated in an airtight container and use with one week after opening. 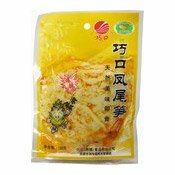 Ingredients: Bamboo Shoot (86%), Water, Vegetable Oil, Salt, Sugar, Flavour Enhancer (E621, E635), Liquorice, Spices, Food Colouring (E120), Preservative (E211, E266), Acid (330). Simply enter your details below and we will send you an e-mail when “Seasoned Bamboo Shoots (巧口鳯尾筍)” is back in stock!